“But is this simply part of the order of nature? Is it because this land of ours is so poor that it cannot afford a decent life to those who dwell upon it? No, comrades, a thousand times no! The soil of England is fertile, its climate is good, it is capable of affording food in abundance to an enormously greater number of animals than now inhabit it. This single farm of ours would support a dozen horses, twenty cows, hundreds of sheep–and all of them living in a comfort and a dignity that are now almost beyond our imagining. Why then do we continue in this miserable condition? Because nearly the whole of the produce of our labour is stolen from us by human beings. There, comrades, is the answer to all our problems. It is summed up in a single word–Man. Man is the only real enemy we have. Remove Man from the scene, and the root cause of hunger and overwork is abolished for ever. “Man is the only creature that consumes without producing. He does not give milk, he does not lay eggs, he is too weak to pull the plough, he cannot run fast enough to catch rabbits. Yet he is lord of all the animals. He sets them to work, he gives back to them the bare minimum that will prevent them from starving, and the rest he keeps for himself. Our labour tills the soil, our dung fertilises it, and yet there is not one of us that owns more than his bare skin. You cows that I see before me, how many thousands of gallons of milk have you given during this last year? And what has happened to that milk which should have been breeding up sturdy calves? Every drop of it has gone down the throats of our enemies. And you hens, how many eggs have you laid in this last year, and how many of those eggs ever hatched into chickens? The rest have all gone to market to bring in money for Jones and his men. And you, Clover, where are those four foals you bore, who should have been the support and pleasure of your old age? Each was sold at a year old–you will never see one of them again. In return for your four confinements and all your labour in the fields, what have you ever had except your bare rations and a stall? “And even the miserable lives we lead are not allowed to reach their natural span. For myself I do not grumble, for I am one of the lucky ones. I am twelve years old and have had over four hundred children. Such is the natural life of a pig. But no animal escapes the cruel knife in the end. You young porkers who are sitting in front of me, every one of you will scream your lives out at the block within a year. 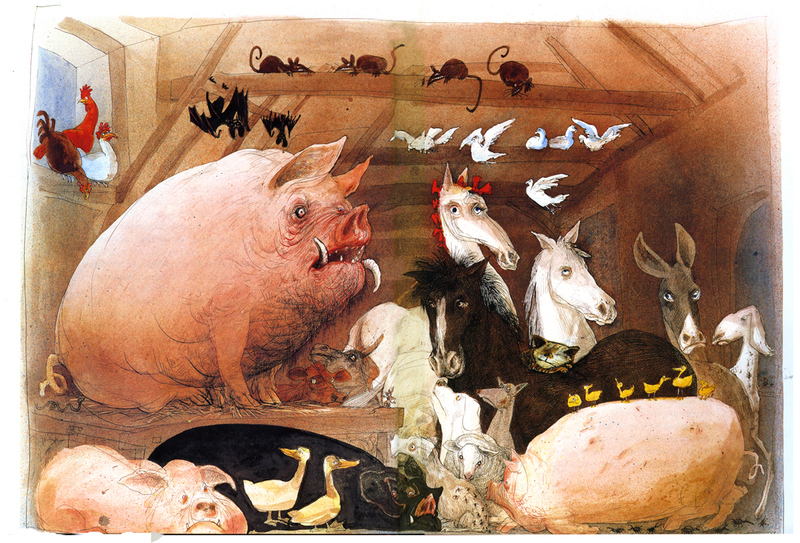 To that horror we all must come–cows, pigs, hens, sheep, everyone. Even the horses and the dogs have no better fate. You, Boxer, the very day that those great muscles of yours lose their power, Jones will sell you to the knacker, who will cut your throat and boil you down for the foxhounds. As for the dogs, when they grow old and toothless, Jones ties a brick round their necks and drowns them in the nearest pond. Questa voce è stata pubblicata in Sirene e contrassegnata con Animal Farm, dreams, George Orwell, Memorie dal Mediterraneo. Contrassegna il permalink.